Creating clothes has always been a hard road for CG artists. Always time-consuming, often arduous, this practice has long needed a program to do the dirty work of shaping, draping, and applying details to their digital assets. Artists, meet CLO Virtual Fashions Marvelous Designer (MD); a 3D clothes modeler whose professional-grade rendering and quick-click templates can take the pain out of complex clothing simulations. Built on swift modeling tools and a mix-and-match layering system that can mimic all types of cloth variations, MD is how digital clothes get made faster. Speed features, like the ability to start from a template (like a shirt) helps 3D creators leap over the initial modeling stages that used to rob them of time and energy. 2D patterns selected from MDs library or created by other users can then be form-fitted to a 3D model quickly for an appealing and adjustable drape preview. Each pattern is easy to manipulate; giving the designer supreme flexibility around final looks in real-time. Our goal is to help designers quickly make clothes that look and drape realistically, said Seungwoo Oh, Founder and CTO of CLO Virtual Fashion. Believability is what makes you stand out. One of the many benefits of MDs physics-based draping technology is that it allows artists to sidestep a familiar modeling problem. Instead of artists being locked into the designs theyve modeled by hand, or the details theyve decided against, MD allows users to apply different outfits, details and clothing expressions to any piece theyve already started. Think the top needs to lose the ruffles? Or maybe needs a new pattern? Thats easy to change; no new modelling, backtracking, or starting over required. This versatility around new ideas helps designers focus their attention on patterns and form rather than detail sculpting and do-overs. The functionality and interface of Marvelous Designer is extremely intuitive, said Joseph Drust, Senior Character Artist at Redstorm. Without even glancing at the Marvelous Designer tutorials, I was able to create a full dress in less than 10 minutes. You need this program if want to design 3D clothes at a professionals pace. Clive Wilkinson, an architect, designer and strategist who has received national acclaim, will speak at NewSchool of Architecture and Design(NSAD) Nov. 14 as part of the schools 2012-2013 lecture series. The event is free and open to the public. Wilkinson will speak about The Architecture of the Large Organization. Acknowledging the social and cultural influences on the workplace that are pressing for massive change, Wilkinsons lecture will address the act of building as an opportunity for large corporations and institutions to transition from one organizational form to another. The lecture will address emerging paradigms and the sociological forces at play, with examples of how these are interpreted within the architecture and design work of his firm Clive Wilkinson Architects. When: Wednesday, Nov. 14, 7 p.m.
Where: NewSchool of Architecture and Design auditorium. Campus located at 1249 F Str. San Diego, Calif. 92101. How: Event is free and open to the public. However, priority seating is given to NSAD students, faculty and alumni. About Clive Wilkinson: Clive Wilkinson is an architect, designer and strategist; and founder of Clive Wilkinson Architects, based in Los Angeles. Established in 1991, his practice has built up an international reputation with projects for clients such as Google, Nokia, Disney, Macquarie and TBWA/Chiat/Day. While dramatic in its architecture, his design process is primarily focused on the social agenda of buildings, and how people connect with each other. His work is recognized for its creative adaptation of urbanism concepts into the interior complexity of buildings. Clive Wilkinson was inducted into the Interior Design Hall of Fame in 2005, honored as a Master of Design by Fast Company magazine in 2006, and a Pioneer of Design by the IIDA in 2011. The practice has been recognized for its radical workplace and education projects with over 75 design awards and is the recipient of the 2012 Smithsonian Cooper-Hewitt National Design Award for Excellence in Interior Design. NewSchool of Architecture and Design (NSAD), founded in 1980, is located in San Diego, California. NSAD is accredited by the Accrediting Council for Independent Colleges and Schools (ACICS). ACICS is listed as a nationally recognized accrediting agency by the U.S. Department of Education and the Council for Higher Education Accreditation. NSADs Bachelor of Architecture, Master of Architecture and Executive Master of Architecture programs are accredited by the National Architectural Accrediting Board (NAAB). NSAD also offers a pre-professional Bachelor of Arts in Architecture, a Bachelor of Science in Digital Media Arts, a Bachelor of Science in Construction Management, a Master of Construction Management and a Master of Science in Architecture. NSAD was ranked among the top 10 undergraduate architecture schools in the western United States, according to the DesignIntelligence report Americas Best Architecture & Design Schools 2012. For more information, visit http://www.NewSchoolArch.edu. The City of Los Angeles announced today it has selected HNTB Corporation to deliver final design and construction support services for the Sixth Street Viaduct Replacement. The new Sixth Street Bridge will be a world-class, iconic piece of Los Angeles infrastructure because of this international design competition and the communitys involvement every step of the way, said L.A. Mayor Antonio Villaraigosa at a press conference earlier today. Los Angeles is where the world creates and innovates, and the selection of HNTB as the winning team reaffirms our ability to cultivate and attract the best and brightest in architecture, design and engineering right here in Los Angeles. Were honored to have the opportunity to create a new icon that helps the City of Los Angeles address the need for urban parks and smart, sustainable development, said Gene Bougdanos, HNTB vice president and Los Angeles practice leader. The new Sixth Street Viaduct is a rare transformative opportunity for this community that will improve mobility, enhance safety, stimulate investment and offer people a place to gather, recreate and connect. Improved access to the Los Angeles River. It was chosen by a panel made of members from the Bureau of Engineering and Caltrans, with unanimous support from the Design Aesthetic Advisory Committee. The DAAC is made up of stakeholders including community members, river advocates, and design professionals. Construction is expected to start in 2015 after approval from the Board of Public Works and the Los Angeles City Council. The project, which will create nearly 5,000 jobs, is expected to be completed in late 2018 and opened in 2019. HNTB has a long-standing presence in Los Angeles, starting nearly 100 years ago with the design of the Colorado Street Bridge in Pasadena and extending to the present with projects such as the I-405 Sepulveda Pass Widening, University of Southern California Galen Center and the new Tom Bradley Terminal at the Los Angeles International Airport. Its a recognized industry leader in the planning, design and construction of complex, long-span and movable bridges. HNTBs bridge practice has been responsible for numerous award-winning signature bridge projects across the United States including the Leonard P. Zakim Bunker Hill Bridge in Boston; the Blennerhassett Bridge in West Virginia; Bob Kerry Pedestrian Bridge in Omaha, Neb; the Lake Champlain Bridge in New York and the Mississippi River Bridge in St. Louis. HNTB Corporation is an employee-owned infrastructure firm serving public and private owners and contractors. With nearly a century of service, HNTB understands the life cycle of infrastructure and solves clients most complex technical, financial and operational challenges. Professionals nationwide deliver a full range of infrastructure-related services, including award-winning planning, design, program delivery and construction management. For more information, visit http://www.hntb.com. AIMS Power Corporation, a global leader in power inverter and solar panel technologies, this week welcomed Joe Clark to their e-commerce design team. Joes unique skills as a graphic designer, photographer and videographer are a great addition to our team. 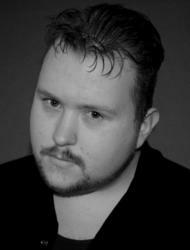 Joe Clark has been a graphic designer for over 4 years. He is also has over a decade worth of experience in photography and videography. AIMS Power markets most of their products over the web and these skills are important as the Reno based company continues to grow and add new products. The Fall 2012 Art At The Market event will be held on September 15th, 2012 from 9:30 AM 2:00 PM, at the Winchester Common farmers market, providing attendees the opportunity to purchase exquisite hand-made collections from Jenne Rayburn, a studio craft artist who will offer one-of-a-kind jewelry and accessories. Jenne will be highlighting her Ark Jewelry Collection. Combining traditional metalsmithing techniques like piercing, stamping, and etching, Ark is a collection of iconic-silhouetted images designed as earrings, necklaces and charm bracelets. These timeless shapes are inspired by the animal characters found in cultural mythologies the world over, and tell stories of how hope, strength and virtue tie us to a greater universal purpose. Expressing big ideas, aspirations, and values, through deeply rooted symbolism, Ark combines ornament with storytelling. 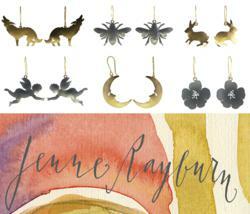 Jenne Rayburn is a metalsmith, enamellist, and seasoned designer who creates lovely, original jewelry and textile designs intended to compliment the vision of the woman who wears them. Jennes approach is rooted in the timeless elements and reflections of nature and natural formations, geometries and juxtapositions. She is inspired by the structure and ornamentation in architecture. She gravitates toward layering and contrasting texture and color. Her work embraces simplicity of form and intricacy of pattern. My wearable pieces are a contemporary distillation of ancient handcrafts and jewelry, the ornament of indigenous peoples, and interpretations of nature, said Rayburn. I love to blend art and history with form and function, combining traditional and innovative contemporary techniques to achieve dynamic color, texture and pattern effects. Jenne is fascinated with myths and folk stories that recount heroic adventures and strive to express the mystery and complexity of the human experience. Grounded by study and admiration of formal and classical design and traditional techniques, yet not constrained by them, Jenne is continually experimenting and seeking out innovative materials and methods that enable her to express her ideas. The annual Art at the Market, presented by the Winchester Cultural Council, is a juried art fair. The jury is comprised of WCC members, practicing artists, art teachers, and committee members who annually judge original artwork of professional quality in any medium for acceptance. The Winchester Cultural Council is a group of volunteers, appointed by the Board of Selectmen, who work to serve the artistic and cultural life of Winchester, MA. For a warm room without high electricity bills, there is no better way than the Radiators. Earlier, radiators look old-fashioned and boring. They were a low-down for a contemporary setting. However, there is good news for all those who avoided radiators, just for their look. CNM Online presents Designer Radiators that are great on looks and high on performance. Available in Standard or Oil-filled variant, Radiators are utilized for warming bathrooms, living rooms, or even showrooms and offices. Then there are dedicated towel radiators offering warm, dry, and fluffy towels post a hot shower. Towel radiators double up as bath-suit dryer, sweater dryer, and perfect for drying socks, premium lingerie, coats, which otherwise can be spoiled when put into regular dryers. Designer Radiators by CNM Online do not oddly stand out in the living room. They add beauty to the room by blending with the interiors. These radiators are high on aesthetics and great on affordability. Be it white ones, or the newly introduced anthracite, or polished ones, these Reina Designer Radiators are also available in brushed steel and chrome models. Either curved or the simple straight ones, the variety of Apollo Designer Radiators at CNM Online will make visitors spoilt with choice. These designer radiators seem so elegant, that at first one will not believe that they can even heat a room. With a wide variety of height, width, and output, these DQ Designer Radiators steal the charm of the room. For Victorian Style interiors, the site has a selected range of Quinn Designer Radiators in cast iron to match the decor. Other options are Italian style steel column radiators and even Convector ones in a single panel for presenting a minimalist style and look in the room. People who are worried thinking about traditional radiators, which not only stood odd in the room by occupying much space, should bid goodbye to this concern. The select range of Prestige Designer Radiators by CNM Online is perfect even for smaller rooms. With vertical design, these radiators range from just 660mm to 2000mm. 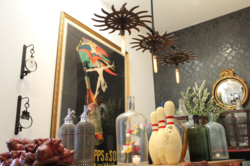 These not only save space but also do not attract negative attention of visitors by fitting perfectly in any room. People who are going for designer towel radiators can select from curved chrome shape, s-shaped, or round ones. More than an appliance, they look artwork at first look. These designer radiators make towel warming an elegant activity. CNM Online offers a wide range of functional products for residential and commercial spaces. With more than 200,000 customers, the site has become one of the leading and largest suppliers offering affordable and efficient solutions in the form of products. A well-know shopping portal, CNM Online is offering unmatched customer service since 2004. Customers like the site for trustworthiness, reliability, and affordable solutions in its wide range of products. When HOAConnections started in Summer 2011, the focus was on designing a hoa website platform that not only provided more functionality than its competitors, but did it at a price that made it an industry leader. The company backed their product up with customer support that wowed their early adopters. However, after receiving customer feedback, they realized that where their hoa websites were a runaway hit their own company website was, “frankly a dud,” according to HOAConnections president, Brian Barrett. 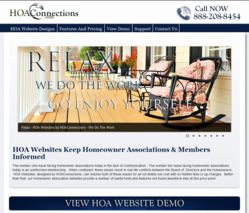 While the wealth of information about their hoa websites was clearly present, the presentation and lack of a cohesive design left their prospective customers confused about the advantages their hoa websites could provide to a homeowner association. In response, HOAConnections set out to retool the message by completely overhauling the look and feel of http://www.hoaconnections.com. In the process, they honed the message from a running list of options that splayed itself across the consumer’s screen like a free form rambling of thoughts to a cohesive well thought out and targeted tool. Now customers are greeted with an elegant, modern interface that helps layout the message of what HOAConnections offers; an easy to use, intuitive, feature rich platform that finally provides a cost effective solution for homeowner associations desiring to communicate better with their homeowners. Through a new graphic interface, it is easier than ever to discover how simple it is to design an association’s hoa website. The consumer can now breeze over the hoa website template choices, see a live demo of a hoa website or view a sampling of current customer’s hoa websites, with no problem. Still in the development phase is a new and improved customer support section that will provide detailed, self help videos of the most important functions of the hoa websites. Not to mention the introduction of the Join Me conferencing software, furthering the company’s commitment to being an industry leader in customer support. If you have been to HOAConnections in the past and felt overwhelmed by the company’s message, or underwhelmed, whatever the case may be. Your homeowner association owes it to themselves to have another look. Click over to http://www.hoaconnections.com and have a look. The company is quite sure you’ll like what you see.